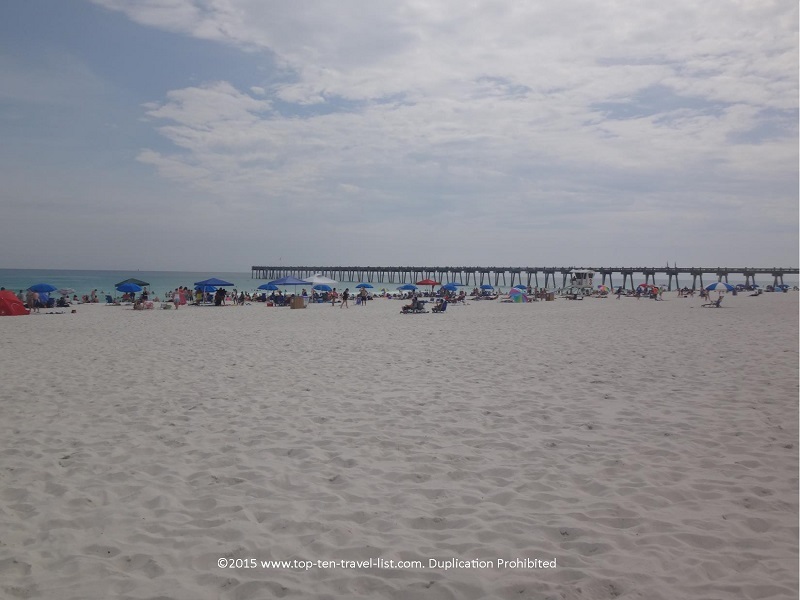 Attraction of the Week: Pensacola Beach on Florida's Emerald Coast - Top Ten Travel Blog | Our experiences traveling throughout the US. The Emerald Coast is a beautiful region of Northwestern Florida, one of the more natural and rural areas of the state. The term Emerald Coast refers to the beautiful emerald green waters found along the beaches of the coastal towns in Florida’s panhandle region. Pensacola Beach, Panama City Beach, and Destin have all become popular spring break & summer destinations due to the crystal clear waters of the Gulf, mild-warm year round temperatures, variety of beachfront restaurants and bars, and abundance of waterfront activities. 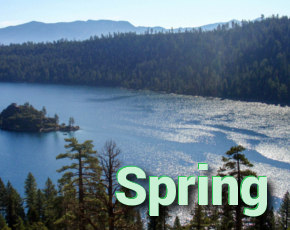 Spring (except for spring break) is a great time to visit as there are many benefits: typically less crowds, prices are a bit cheaper, and the temperatures are not as intense (daytime averages are in the upper 70’s-lower 80’s – compare that to 90’s with extreme humidity in the summer!). Although the water will be much too chilly for swimming (summer brings forth the famous bath water like temperatures), most other activities like beach volleyball, relaxing with a good book on the beach , catching a sunset, fishing, boating, cruises, waterfront dining, collecting seashells, etc. will be much more enjoyable. 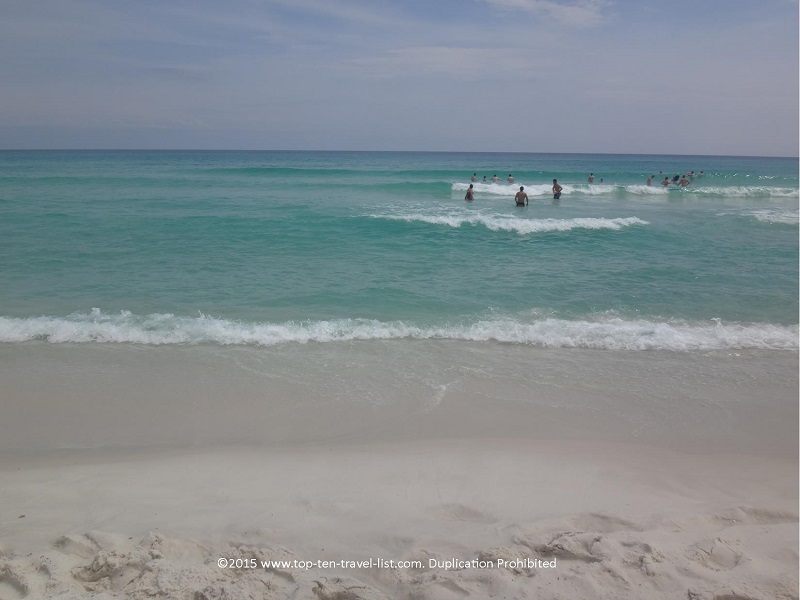 Nothing but beautiful clear water and soft white sand to be found at Pensacola Beach! Although you may see a few swimmers out, the water temps generally are much too cold during the spring months! 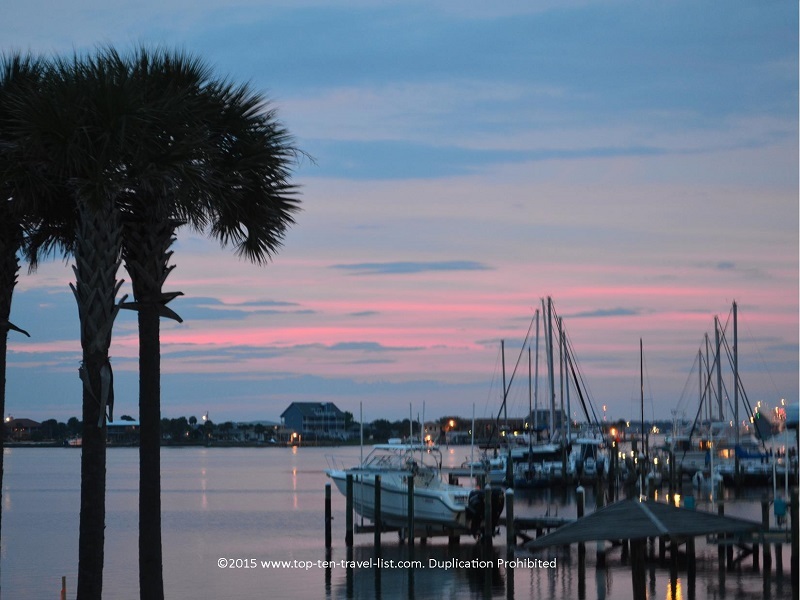 Pensacola is the perfect place to plan your Emerald Coast beach vacation. The area sees less tourists than Destin and Panama City, yet still has the same gorgeous beaches with sugar white sand and emerald green waters. As an added bonus, Pensacola’s historic downtown area is especially nice. Add in a handful of great waterfront restaurants, plenty of outdoor fun, and a nice lineup of yearly events, and you have a fun-filled itinerary. 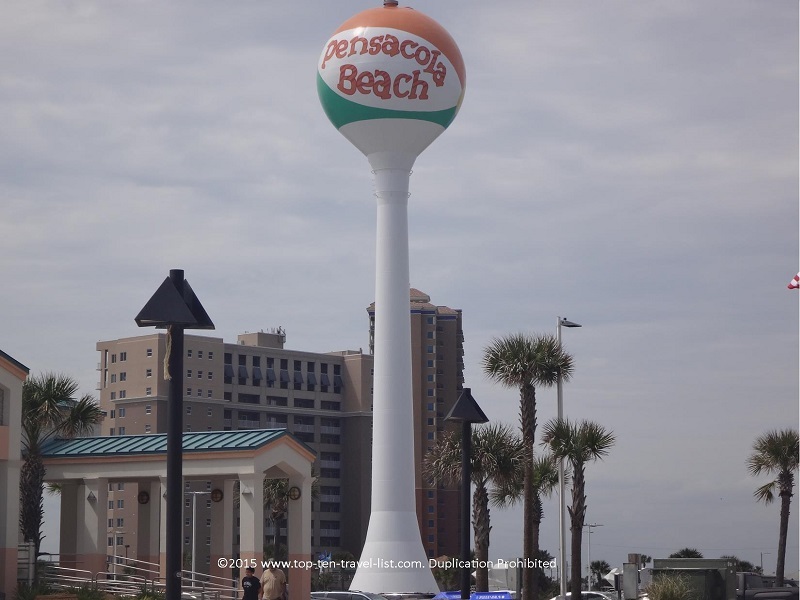 The iconic Pensacola Beach Ball Water Tower. Pensacola Beach is located on Santa Rosa Island, which is one of the longest barrier islands in the US. The waters are a beautiful blueish green color and the white sand is smooth and cool to the touch. It’s the perfect beach for a lazy, laid-back vacation. You can easily spend your entire vacation at the beach. It doesn’t get as crowded as some of the more popular beaches in Florida, hence, providing a much more relaxing setting for long days at the beach. Besides sunbathing and listening to the waves, there are many more opportunities for fun at the beach. Beachfront bars and restaurants, water sports, and sightseeing are also available. The 1400+ foot pier provides the perfect opportunity to fish or admire local marine life such as dolphins and manatees. View of the pier from a distance. The Portofino Beach boardwalk is home to a number of bars, restaurants, and shops. Cactus Flower Cafe (Mexican cafe) and Hemingway’s Island Grille are 2 popular dining options. Those looking for more of a bar experience can head over to Bamboo Willie’s, a beachfront bar featuring an outdoor deck overlooking the water. 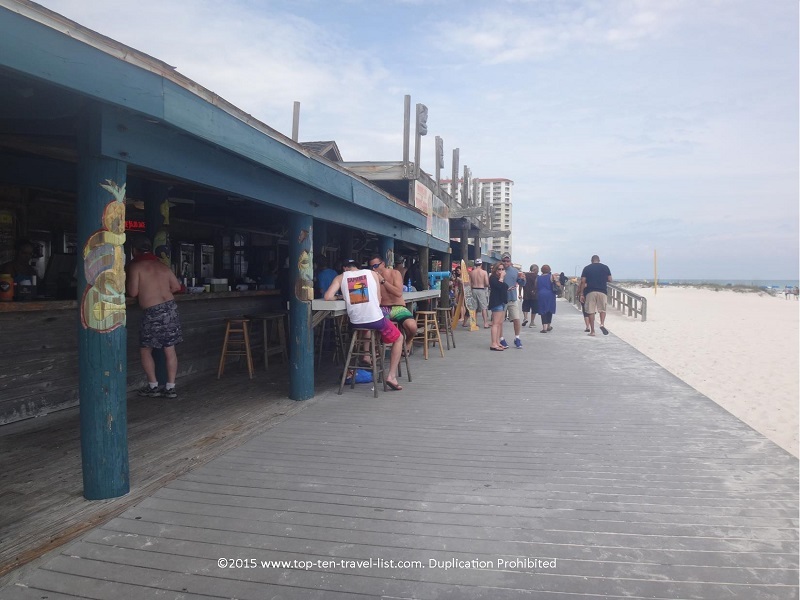 A few of the outdoor bars on the beach. The Grand Marlin is a fantastic waterfront restaurant offering a wide range of seafood specialties. 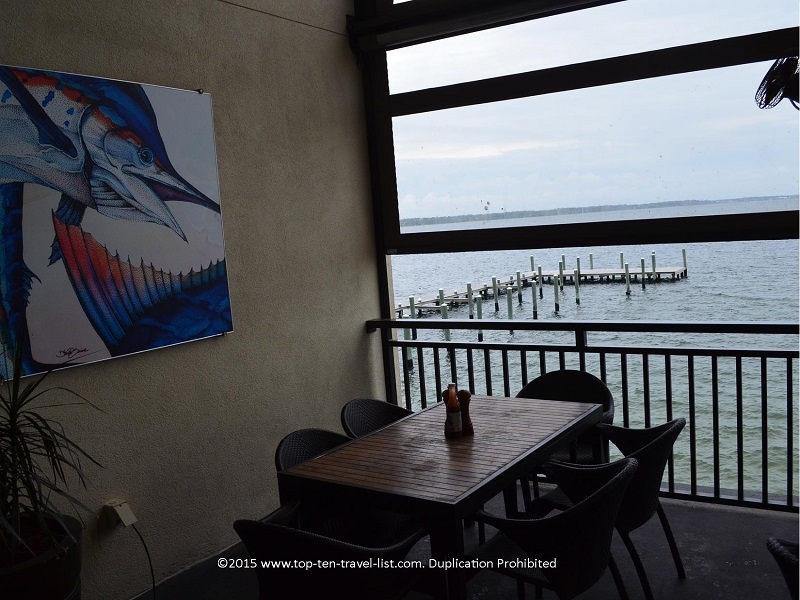 The airy outdoor deck allows you to enjoy a casual meal while taking in pretty views of the Gulf. The menu is easily customizable to fit a gluten-free diet, one of the few restaurants in the area to offer so many options. 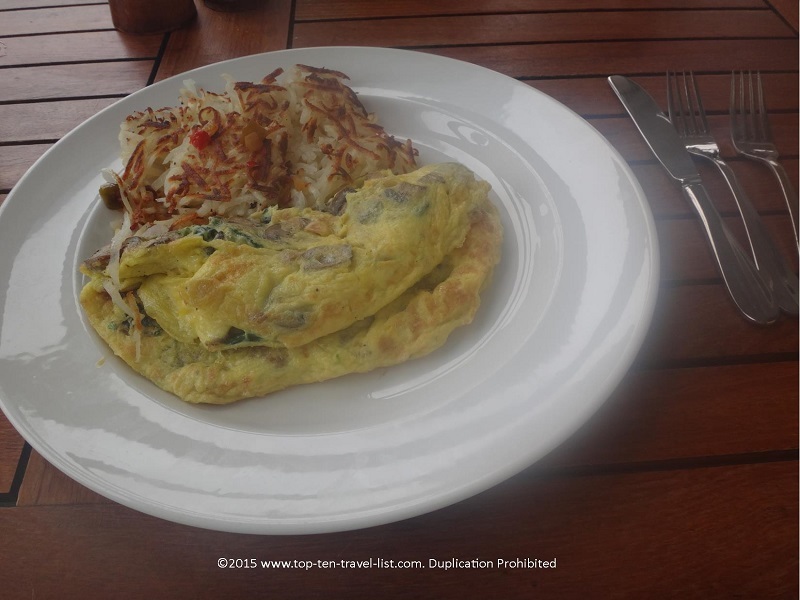 Weekend brunch is an ideal time to enjoy a delicious omelet on the beautiful outdoor deck. Great water views dining outside at The Grand Marlin. The Grand Marlin features an extensive menu of breakfast favorites, including seafood options and a variety of gluten-free selections! 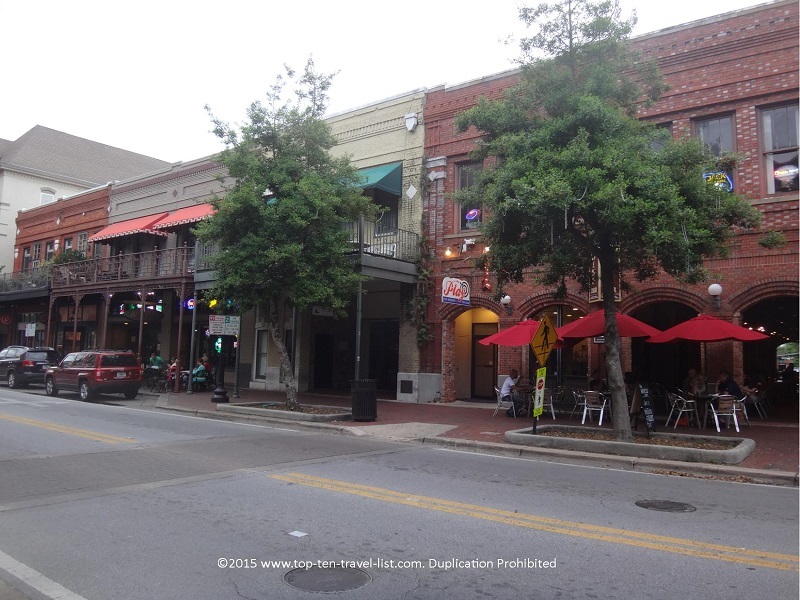 Downtown Pensacola is a quaint little section of town with beautiful tree lined streets, historic architecture, and plenty of local shops and restaurants. 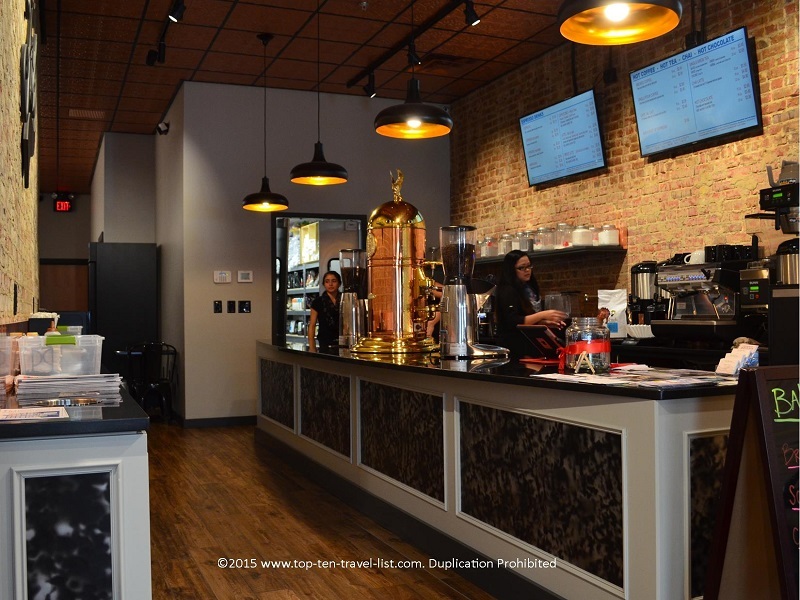 Stop by for a coffee at Fosco Coffee Barre, a great little shop with fantastic espresso drinks and an attractive setting featuring brick walls. Also be sure to enjoy an authentic Italian dinner at V Paul’s Italian Ristorante, a great Italian find featuring excellent dishes, professional service, and a classy modern setting. 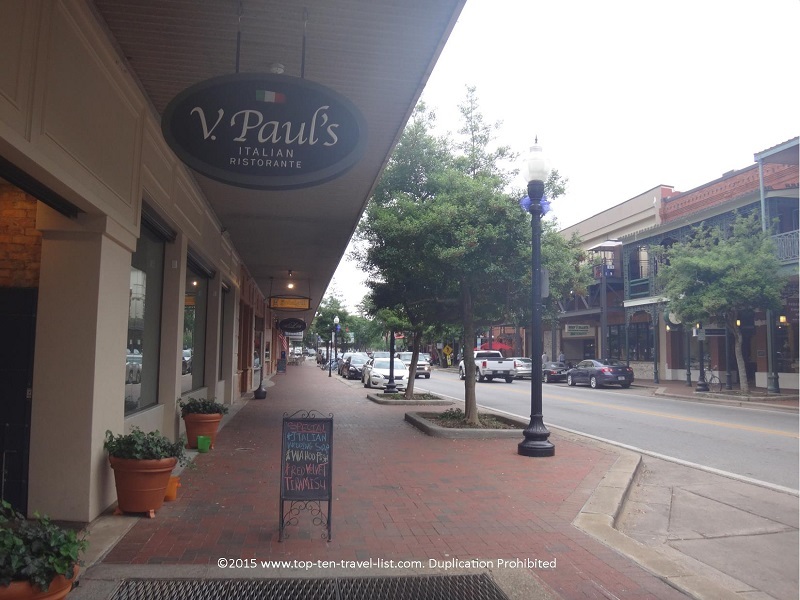 V Paul’s Italian Ristorante in downtown Pensacola is a must try on your visit! 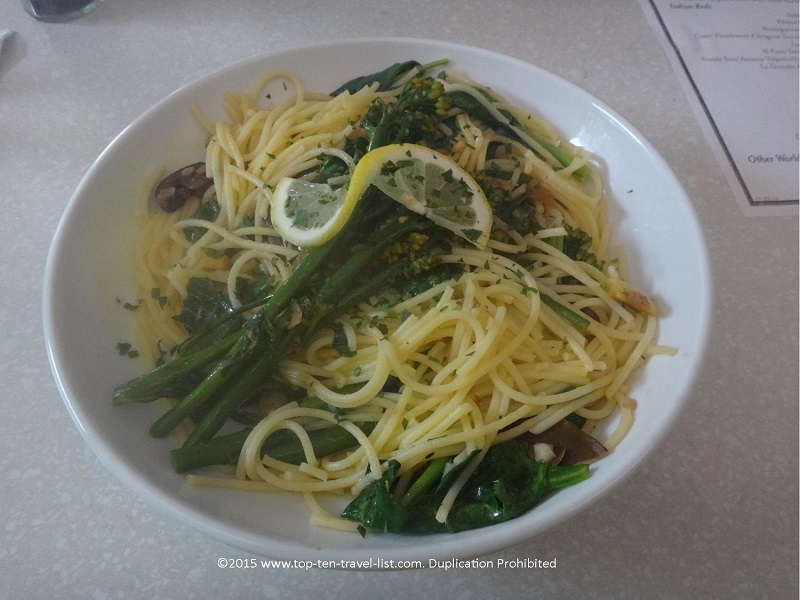 The Gluten-free Pasta Primavera is an excellent choice! 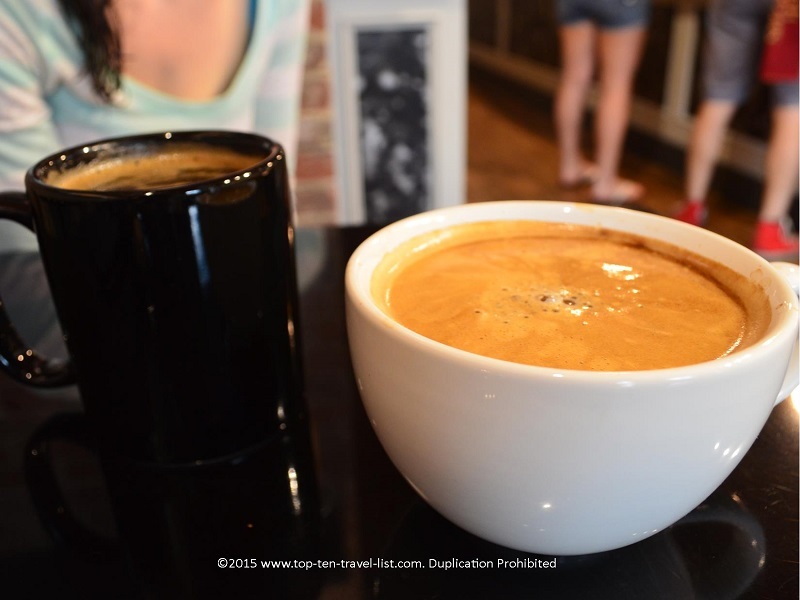 Fosko Coffee is a great local choice! More fun in Pensacola Beach! In addition, Gulf Shores, Alabama is only an hour or so away. Here you will find beaches, state parks, cruises, the Alabama Gulf Coast zoo, various mini golf courses, and Waterville USA water park. *Be sure to check your hotel lobby for valuable coupons to local attractions (many of which are listed above!). For cruises, be sure to book well in advance as they tend to sell out rather quickly. 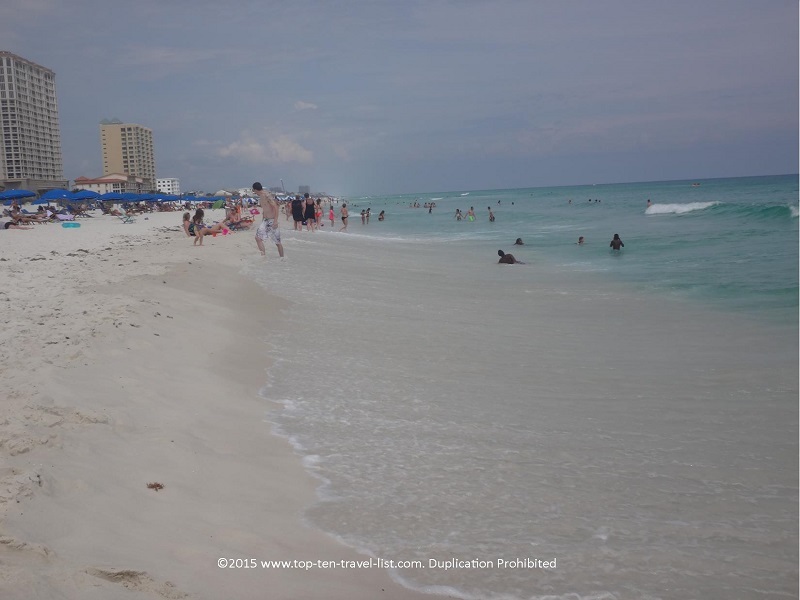 Overall, Pensacola Beach is a wonderful area to plan your Florida vacation. The area is much greener, quieter, and less touristy than more popular areas like Clearwater, Miami Beach, and Sarasota. In general the area feels less congested with more of a natural, beachy vibe. You will find more individual restaurants versus chains, more green grass and trees vs. concrete, and pristine, uncrowded beaches. Nature, beaches, relaxation, and fun all await you on your Emerald Coast vacation! 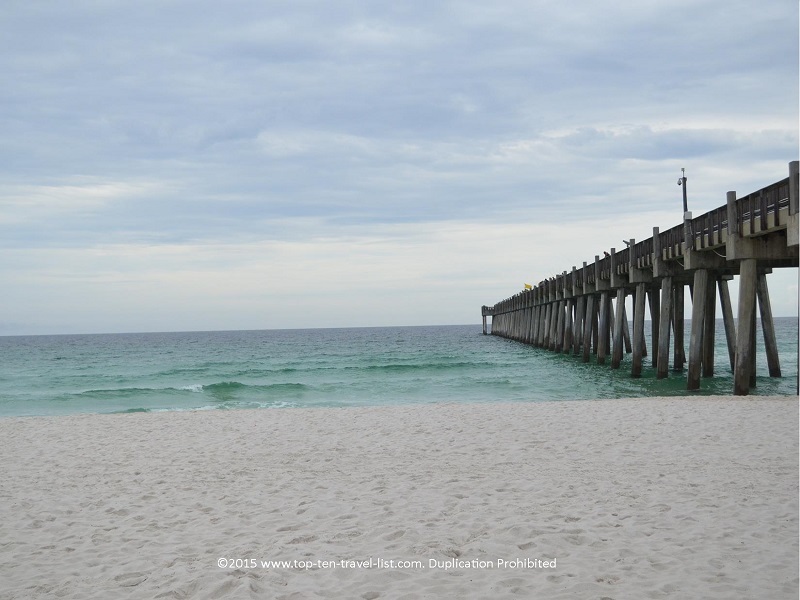 Have you ever visited Pensacola Beach? 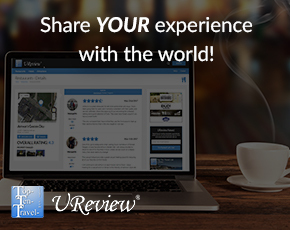 What attractions/activities would you recommend? What other Emerald Coast destinations have you visited?